Cannabigerol (CBG) is a cannabinoid found in marijuana. It is the parent molecule (called a precursor) of both THC and CBD, which are the main active ingredients that account for its medicinal and recreational effects. As such, CBG is often called the mother of all cannabinoids. During growth of the cannabis plant CBG is continuously converted into CBD, THC and other cannabinoids via enzymatic action - which is activated by the genes in response to environmental conditions: heat, light, moisture, nutrition, stress, microorganism, other..
At any point in time, CBG concentrations are usually in the 1% range, or 10-20 times lower than THC (in high THC strains). The lower concentration of CBG in comparison to the other cannabinoids makes it difficult to identify its efficacy. CBG-CBN-THC-CBC bio-synthesis 1 = cannabigerol (CBG); 2 = cannabidiol (CBD); 3 = cannabichromene (CBC); 4 = delta-9-tetrahydrocannabinol (THC). Also, cannabinoids THC, CBD and others like CBG have been found to work much better together than in an isolated form. Synergistic effects and interrelationships are very important in medicine, however, mainstream pharmaceutical practice generally ignores this fundamental As a result, the pharmaceutical machine is producing,patenting and pushing isolated, single molecule medicines, while suppressing the much more effective whole plant extracts. An interesting thing to know about CBG would be, what are the medicinal and psychoactive effects of THC + CBG, THC + CBD + CBG, in varying ratios, given to a variety of individuals? It's known that CBG has a high affinity α2-adrenergic receptor agonist, moderate affinity 5-HT1A receptor antagonist, and low affinity CB1 receptor antagonist. It also binds to the CB2 receptor as an antagonist (dial down activity). CBG does not trigger THC-like activity in rodents and primates, verifying that it is not an intoxicant. In rodent models, CBG taken alone in high doses (80 mg/Kg) did not promote locomotor suppression, catalepsy, hypothermia or analgesia. Note that very small changes in the bond structure cause massively different responses with the cellular receptors that control bodily and cognitive (brain) function. For example, d9THC (top left above) is strongly psychoactive, while d8THC is very weakly psychoactive. This difference in structure leads to an understanding about how cannabinoids bind or interact with receptors. CBG has shown potential for alleviating neuropathic and other pain in animal studies. CBG might even have a higher efficacy than CBD. CBG can modulate the uptake of GABA in the brain, to decrease anxiety and reduce muscle tension. GABA's principal role is to reduce neuronal excitability throughout the nervous system. GABA is also directly responsible for the regulation of muscle tone. Lab tests on rodents showed that CBG is an antidepressant similar to imipramine. Imipramine, or Tofranil is a tricyclic pharmaceutical antidepressant. It is mainly used in the treatment of major depression and enuresis. Being a cannabinoid, CBG's safety profile is probably extremely high, making it a candidate to replace pharmaceuticals with a multitude of toxic side effects. It has been shown to improve inflammatory bowel disease,ulcerative colitis and Crohn's disease in animals. Obviously, this promising finding invites clinical study in humans. CBG boosts the body’s natural skin moisturizers, holding promise for dry-skin syndromes and promotes full hydration, which makes the face look much younger. Cannabigerol has been shown to relieve intraocular pressure, which is the cause of glaucoma. CBG has neuroprotective properties, with hypothetical efficacy in the treatment of neurodegenerative diseases such as Huntington’s disease and multiple sclerosis (MS). CBG is known to have antiseptic properties and research suggests that it might be effective against the superbug MRSA. CBG is showing promising properties in vitro for the potential treatment of a broad range of cancers, including breast, liver, lung, pancreatic, skin, ovarian, renal, bladder and colon cancer. The scientists know a lot. If this explanation is beyond your pay grade, don't worry, the takeaway is that the scientists have established how CBG and the cannabinoids are created in the plant. In fact, at this point, cannabis is probably the most studied plant on the planet, and by a wide margin. Basically, the from several building blocks - smaller molecules - with energy from sugar derived from the sun, several enzymes assemble the cannabinoids in a step by step fashion. The biosynthesis of CBG starts by loading hexanoyl-CoA (coenzyme) onto a polyketide synthase assembly protein and subsequent condensation with three molecules of malonyl-CoA. This polyketide is cyclized to olivetolic acid via olivetolic acid cyclase, and then prenylated with a ten carbon isoprenoid precursor, geranyl pyrophosphate (GPP), using an aromatic prenyltransferase enzyme, geranyl-pyrophosphate—olivetolic acid geranyl transferase, to biosynthesize cannabigerolic acid (CBGA), which can then be decarboxylated to yield cannabigerol. From cannabigerol, the cannabis creates the other cannabinoids, including THC and CBD. Cannabis alchemists round the world are seeking to produce high CBG strains, using selective breeding combined with genetic testing. It would seem that efforts would focus primarily on the shutting down the enzyme system that converts CBG into THC or CBD full stop. There may be environmental factors to manipulate the action of the focal enzymes (CBG to THC) such as nutrients, lighting, stress. Perhaps starving the plant of certain amino acids might work? In any event, professionals from around the web are predicting we'll see high CBG strains = 5%+ in the near future. CBG itself a Scheduled substance in the US, Canada, Europe and the rest of "the free world". However, extracts of any component of the cannabis plant are illegal in many areas. Today, Cannabinoids THC and CBD from cannabis plant are Schedule I controlled substances, laughably in the same class as heroin, crack and other dangerous narcotics. CBG and other cannabinoids are left alone for now, however, if its use goes viral, the reflex action of the DEA, based on precedent with the non-psychoactive CBD, is to label it Schedule I, despite having no psychoactive effects, low in toxicity, is a naturally occurring substance and it may be highly medicinal. CBG is not scheduled by the UN Convention as a Psychotropic Substances. 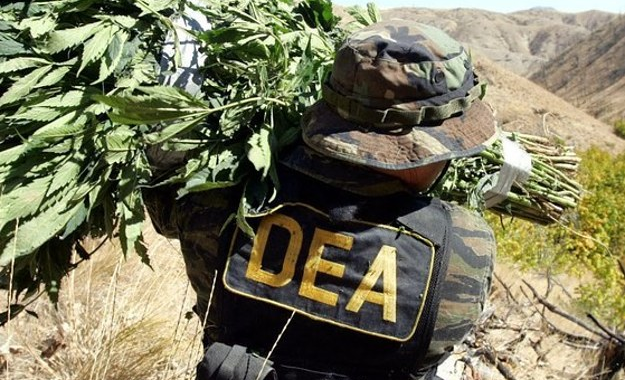 DEA and the war on drugs. Billions of dollars spent, no gains, much harm. CBG is not scheduled at the federal level in the United States, unless it is produced from those parts of the Marijuana flower or leaves. This is simply a naked scheme to block CBG from the public. THC and CBD are the only naturally-occurring cannabinoid that are scheduled (1). All other naturally-occurring cannabinoids are not scheduled in their own right. The Marijuana plant (genus Cannabis sativa L.) is scheduled excluding the seeds and mature stalks. Specifically, any compound or extract that originates from the scheduled parts of the Marijuana plant is also scheduled, including sucrose (sugar) derived from Marijuana). Synthetic or biosynthesized CBG is not scheduled. 420EVALUATIONSONLINE California and Nevada: We provide 100% online medical marijuana cards, cannabis ID, and growers permits, in minutes. Patients don't pay unless they are approved, Documents are used at dispensaries, cooperatives, cannabis clubs, online delivery services and other points of marijuana access. CBG coming soon? You won’t find many CBG marijuana strains currently on the market, but thanks to breeders like those at TGA genetics Subcool Seeds, the breed Mikey Kush exists. Mikey Kush strain is a Sativa-dominant strain testing with high levels of CBG and THC levels of 28.6%. CBG marijuana strains are becoming more available in Europe, and will most likely start to be seen on the shelves in North America soon. Research will surely continue, and as public interest increases, growers will be encouraged to produce high-CBG strains themselves. Certain strains of European hemp (which produces high CBD) can carry a genetic mutation that causes the “CBD-gene” to become inactive, and the plant accumulates cannabigerol instead of CBD. Botanists have shown this is a recessive trait, but it’s still possible to harness CBG-producing genetics for patients and dispensaries around the world. While it may take some time, have confidence that CBG-only strains will soon be as available is CBD cannabis. Hybridization between these different types of strains will allow patients to use medicinal cannabis tailored to their needs and preferences in a way people only can dream of today. “Many of us are cannabinoid deficient. A multitude of disorders and their symptoms come come from a deficiency… CBG, the stem molecule which quickly converts to CBD, THC and other cannabinoids. CBG might turn out to be the most medicinal of the lot ." CANNABIGEROL (CBG) - BETTER THAN CBD?